Records of Modern birds (Neornithes) from the Age of Dinosaurs or Mesozoic Era, are very scarce and patchy. Most specimens are represented by isolated bones or strongly incomplete skeletons. This contrast with toothed birds, which are widely represented and known by abundant skeletons. However, a recent report of a nearly complete skeleton of a modern bird in 70 million years bed from Antarctica has blurred such panorama. The specimen belongs to Vegavis iaai, a fossil duck-relative, that is the best-known modern bird from the Mesozoic Era, and constitutes the most informative source for comparing with taxa known from more fragmentary specimens. On the basis of such comparisons, scientists were able to recognize that Vegavis was closely related to other Southern Hemisphere fossil birds, namely the Cretaceous Neogaeornis wetzeli from South America and Polarornis gregorii from Antarctica, as well as Australornis lovei from New Zealand. This grouping was baptized as Vegaviidae and constitutes the first group of modern birds from the Mesozoic. 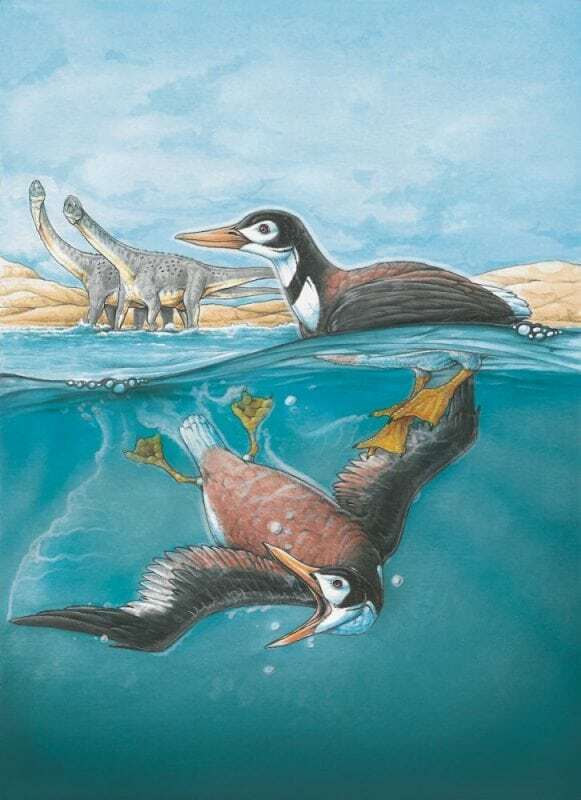 Vegaviids were diving birds with a pointed beak and weak flight that inhabited the seacoast, surrounded by wooded lands and diverse kinds of dinosaurs, that inhabited Antarctica by that time. However, vegaviids were not restricted to the Age of Dinosaurs. In fact, Australornis was found in beds of age immediately posterior to the mass extinction that disappeared large dinosaurs and marine reptiles. This constitutes the first documented case of a group of birds surviving such extinction. This opens a new question: why vegaviids survived such catastrophic event? Which were the advantages that vegaviids had over other birds? The answer is probably inside the bones. Paleohistological analysis of vegaviids Polarornis and Vegavis allowed paleontologists to recognize that they had a very high metabolism and that they grew quickly and reached adulthood in less than a year, a condition unique to modern birds. 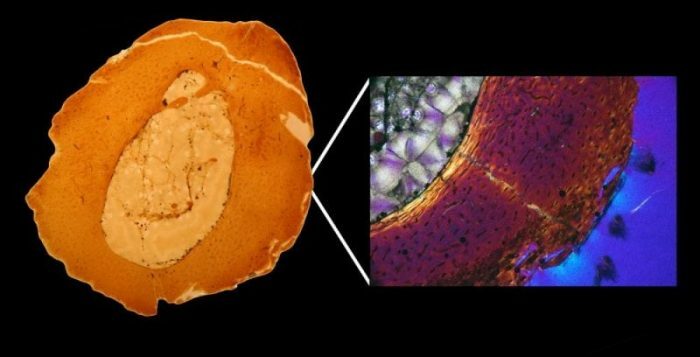 Analysis of more primitive toothed birds shows that most of them grew slowly and probably in pulses, with some intervals in which the metabolism rested (as occurs in modern reptiles). Thus, it appears to be certain that the high metabolism and rapid grew of Vegavis and its kin probably allowed them to overcome the difficulties of living in one environment as cold as the Antarctic, being resistant to hostile climate. This may result in that vegaviids, as modern birds, were pre-adapted to survive the “nuclear winter” that followed the meteoritic impact that ended with the Dinosaur Age. Agnolín, F.L., Brissón-Egli, F, Chatterjee, S., García Marsà J.A., Novas F.E. 2017. Vegaviidae, a new clade of southern diving birds that survived the K/T boundary. Naturwissenschaften, 104(11-12): 87. Clarke, J.A., Chatterjee, S., Li, Z., Riede, T., Agnolin, F., Goller, F., Isasi, M.P., Martinioni, D.R., Mussel, F.J., Novas, F.E. 2016. Fossil evidence of the avian vocal organ from the Mesozoic. Nature 538: 502–505. García Marsà, J., Agnolin, F.L., Novas, F.E. 2017. Bone microstructure of Vegavis iaai (Aves, Anseriformes) from the Upper Cretaceous of Vega Island, Antarctic Peninsula. Historical Biology, https://www.tandfonline.com/action/cookieAbsent. The study, Vegaviidae, a new clade of southern diving birds that survived the K/T boundary was recently published in the journal The Science of Nature. This work was led by Federico Agnolin from the Universidad Maimónides. Federico is a research scientist at the Museo Argentino de Cientias Naturales "Bernardino Rivadavia."